A valid e-mail address is very important as it is the first line of communication on the Internet. If you haven’t noticed, your email address is almost always being requested when you sign up for any online account such as Facebook, or even when you submit a web form. This is logical because it allows the website operator to be able to contact/identify the person who submitted the form or registered for the account. Most of the time there is already a verification process built into a registration system. The person who registered the account will have to login to the email provided during the registration and click on a unique link to complete the sign up process. While this method seems to work, there is always a chance that the user submitted the wrong email address due to misspelling or a spammer using a disposable temporary email address. If you’re into online marketing, maintaining a list of valid email address is important to avoid over spending in sending newsletters to bad email addresses. A manual way of testing if an email address is valid or not is by sending an email to the recipient. Receiving an automated soft or hard bounce reply from the mail server shows that the email is invalid. Even if you don’t receive a reply, it doesn’t necessarily mean that the email address exist because some mail servers are configured as catch-all to receive both correct and incorrect email addresses. For a more robust and automated email verification, here are 10 sites that are able to perform deep level SMTP verification for free without even the need to send an email to the address. Kleber is one of the software platforms created by the DataTools company based in Australia. With a single subscription to Kleber, you have access to many tools that can capture, parse, verify, repair, match, and enhance data. One of their verification tools is the ability to validate email addresses. A demo of the email verification system can be tested at their showcase webpage. During testing, we found that Kleber email verification can accurately determine the validity of email addresses from Yahoo, Outlook, Gmail and can even detect disposable email addresses. The email verification showcase webpage doesn’t seem to employ a limit because we were able to manually test as many email addresses as we wanted. Kleber offers an attractive 90 days free trial that comes preloaded with $50 of credit. Do take note that Kleber is more suited to developers who want to implement a verification system through Klebers API. It doesn’t come with a ready to use system where an end user can import a list of email addresses for automated verification. Bounceless claims to be the fastest in the email verification industry validating up to 600 email addresses per minute. You can either import an email list for automated mass email verification or implement their API which is very useful for real time checking in contact or sign up forms. You can find their free real time API test at their main site which is somewhere at the center right hand side of the page. Simply enter an email address and click the “Try It” button. You’ll need to manually refresh the page by clicking the F5 button to perform another test. It is quite inconvenient although the free real time API test doesn’t seem to have a limit as well. If you sign up for a free trial account, you get 100 free credits which allows you to validate up to 100 email addresses. We tested the batch verification by importing a sample list containing 50 email addresses, and it took nearly 10 minutes for the whole verification process to complete. Email Hippo is one of the most powerful email validation platforms if it is not the most powerful. Their system is able to handle up to 500,000 email addresses in a list which is far more than any of their competitors can handle. This year they’ve even managed to work out a private method that can handle Yahoo email addresses at large scale, a problem which many other email verification companies are still struggling with. While it seems like you need to register a free account to test their email verification system, they actually have a hidden subdomain that allows you to perform 20 free tests without going through the sign up process. Simply enter the email address that you want to verify in the input box and click the Check button. The result will be displayed at the table below. As you can see from the screenshot, we tested a disposable email address and it shows an “Unknown” result. Clicking the Why hyperlink will popup a small box displaying the reason of the result. Email Hippo offers a free trial account that allows you to check up to 100 email addresses at their “one time list” verification. 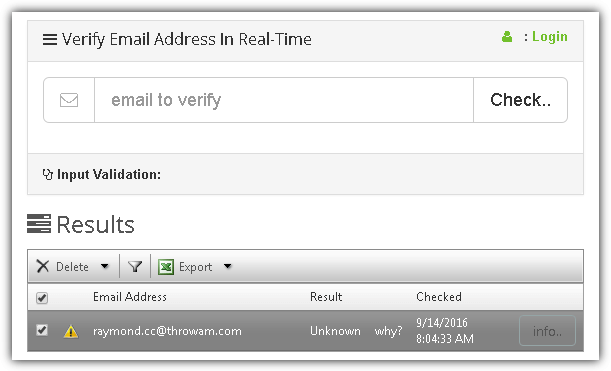 During testing, Email Hippo took 5 minutes to complete checking 50 email addresses in a list. The Experien Data Quality company operating model is similar to Kleber where they have multiple data quality products for cleansing, standardization, matching, monitoring, enrichment, and profiling. This includes a real time email validation that anyone can try for free up to 10 times. If you are looking to validate an email list at EDQ, you can submit a CSV or XLS/XLSX file for processing and wait for a summary report to be sent to your email. Once you get the report which is usually less than 48 hours, you can then decide whether to pay to download the cleaned email list. A 30 days trial account that comes with 500 free searches can be requested but has to be manually approved by EDQ. 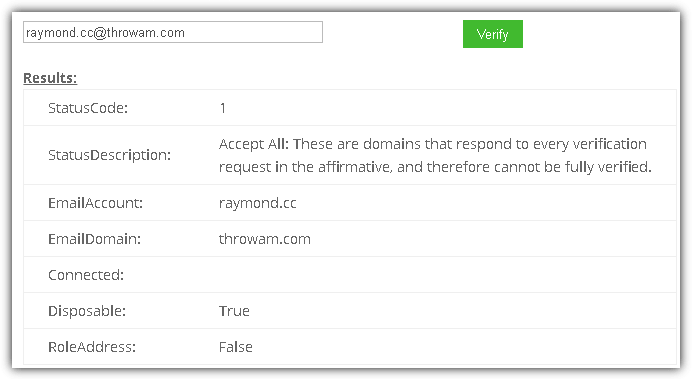 NeverBounce is another email verification company that allows you to validate email addresses in real time, or in bulk in the form of a file list. 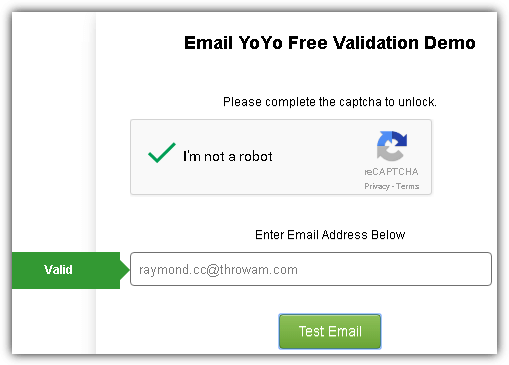 For a free test without signing up an account, you get to validate up to 5 email addresses. The verification form can be found on their website somewhere in the middle of the page. Apart from the standard features, you can find a unique feature that can quickly analyze a list to give an estimation if the list should be cleaned prior to mailing. This free analysis is available to registered users including the free accounts. NeverBounce is also very generous in offering 1000 checks per month to free accounts, but do take note that the 1000 credits is only for validating single emails and cannot be used in automated bulk checking. PCA Predict offers a few services such as verifying email, phone number and address, geocoding an address, distance finder, and cleaning up inaccurate address data. You can find the email verification demo at their website which allows only 2 checks per day for an IP address. While it is possible to sign up for a free trial account, you won’t get to use much of its service for free because you’re only given 1£ of credit which will run out after 12 checks. From their API documentation, it is revealed that the email batch validation can only verify up to 100 emails per batch. 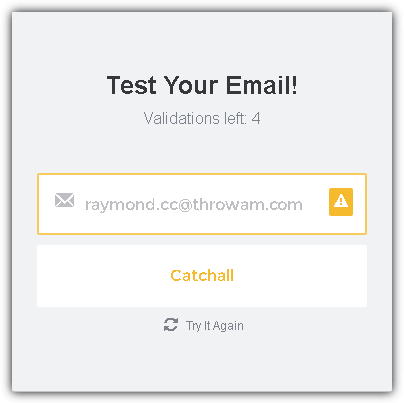 Email YoYo has a free email validation tool checker that can be used by anyone with the limitation of only 3 checks per IP address. It is also necessary to complete the CAPTCHA test before you can use their online tool. Email YoYo has a 5% price beat guarantee and they claim to match or exceed any competitor for accuracy and speed. You can contact them for a 7 days free trial to access their email validation API. 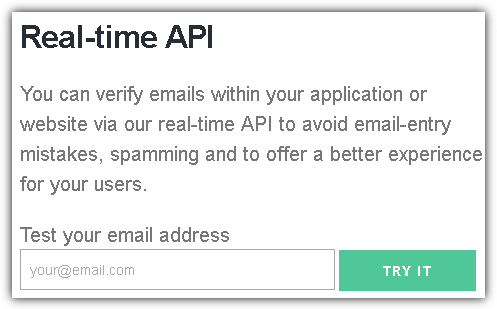 Email-Checker offers real time email verification through an API and also bulk list verification at an affordable price. 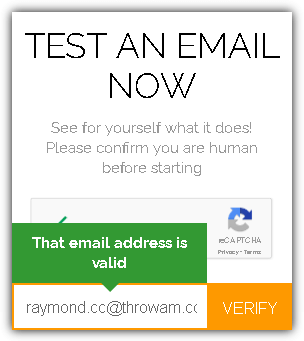 There is a demo where you can test their real time email verification after solving the captcha by ticking the “I’m not a robot” checkbox to prevent abuse. The maximum free usage is only 2 per day for an IP address. So if your ISP assigns dynamic IP address to your Internet connection, you can simply reconnect to get a new IP address and you will be able to perform 2 more checks. While they claim to have solved the Yahoo email verification problem, they don’t seem to be able to detect disposable email address. As you can see from the above screenshot, we tested a DEA in the demo and it shows that the email address is valid. Do take note that their bulk verification can only support up to 50,000 maximum emails per file. Kickbox has one of the most beautiful and modern web interfaces that works on both desktop and mobile browsers. To test their services, you’ll have to sign up for a free trial account that gives you access to verify a single or a list of email addresses, a real time verification API to integrate into your own program and Recipient Authentication which is a real time email confirmation app created by them. 100 credits are offered to every free trial account which can be used to verify single email address or even a list. We uploaded a sample of an email list containing 50 addresses and it took Kickbox 5 minutes to complete the verification. Kickbox also successfully flagged a disposable email address as risky when we put it to test. 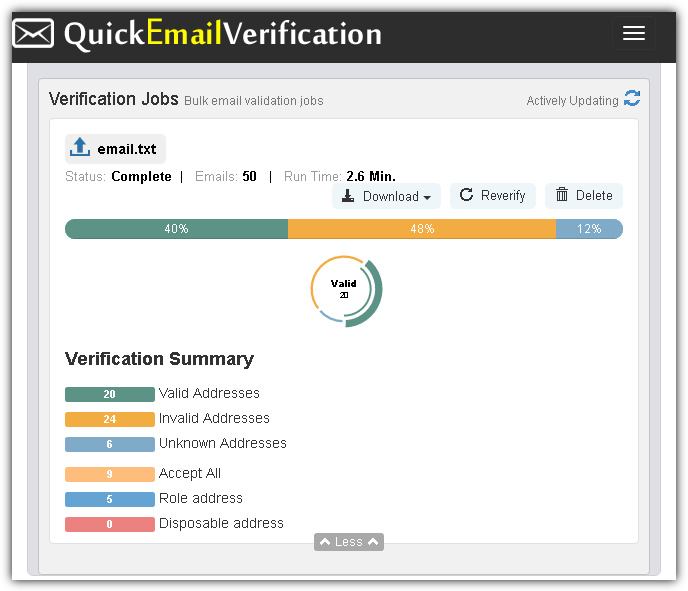 QuickEmailVerification lives up to its name because they are really quick in verifying email addresses. We uploaded the same list containing 50 sample email addresses and it took only 2.6 minutes to complete the validation, while most of its competitors took twice the amount of time. 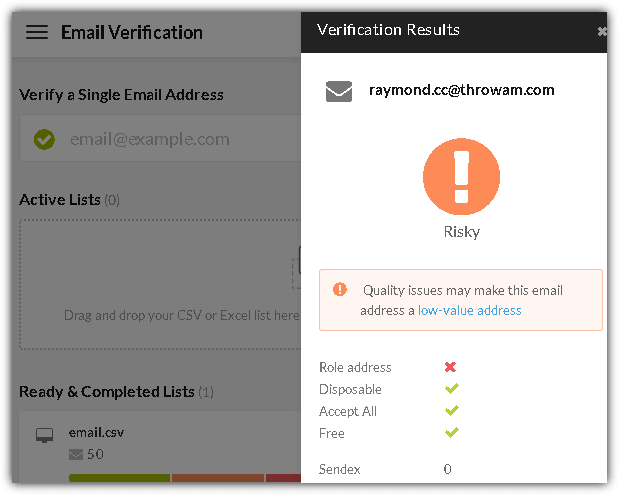 Not only you can upload the list from your computer, QuickEmailVerification can also import from third party popular services such as MailChimp, VerticalResponse, ConstantContact, CompaignMonitor, Emma, AWeber and GetResponse. To test their email verification service, you’ll need to sign up for a free account which gives you 100 daily credits. This means that you’ll be able to use their service to test up to 100 email addresses every day for free! Additional Notes: There are at least 10 other email verifiers which we’ve tested but they do not make the list due to inaccuracy in verifying the validity of Yahoo email addresses. They either report all Yahoo email addresses as valid or invalid, while there are also some companies such as Email Hunter that simply report all Yahoo email addresses as risky or not guaranteed to be a good address. Rest assured that all 10 email verification services which we’ve listed above can accurately detect if a Yahoo email address is valid or invalid. I want to have my own service like those mentioned? Some services have their own API which you could use, you will have to check online to find one though (Not sure any of those listed here have available APIs). Great tools mentioned. I would like to add that Debouce.io gives free credits for bulk email verification as well as offers free email verification API for checking disposable email accounts. this is a great list. but you forgot the one with unlimited free email verifications. Easy to use, free, no ads and more reliable. An excellent article Raymond. Thank you so much for putting together a list of some of the free email verification tools list. We recently evaluated several vendors for verification and have found most of them to all offer the same thing. Let’s face it, verification is a commodity. Melissa(dot)com is someone we found their service offering to be excellent at an affordable price because not only do they offer the same verification services as everyone else, but they offer email hygiene services along with other data point validations. One more cool service which is worth mentioning is snov.io . It is very accurate with its multi-step verification process, it sorts out ‘catchall’ emails and reduces false positive results. They give 200 free credits everyone each month! Hi -I work for Email Hippo. Thanks for the mention. Just to give you an update. The 500,000 amount isn’t our maximum file size. It’s the number of email addresses you can upload / cut and paste onto your dashboard and self-serve for your bulk email checks. We validate lists far larger than that, as well as providing an API. Also the 20 a day free checker is a thing we do to help people who don’t need to validate many emails. Here’s our tools site where there are other free, useful services – tools.verifyemailaddress.io Enjoy!